for us at this pivotal moment in the history of humankind. ​of the processes taught and described in each Class. I will personally be guiding you energetically within each separate initiation. ​in opening to deeper alignments within your self. Energetic Symbols will be presented to you, and you will be guided into energetic doorways within the Symbols where you will receive multi-dimensional initiations. Within these dimensional spaces you will begin to connect to aspects of your own light energy. When you journey within the doorways of light contained within each Symbol you will begin to re-align to your own unique frequency of light. As you anchor this frequency of light into the cells of your body, the cells will begin to awaken. You may experience this as an awareness or sensation of pulsing within your cells, like a heartbeat of light. As you awaken to this heartbeat, your cells will begin to transmit your own unique light frequency out into the universe. You are then recognized through your unique frequency and received by the Collective Consciousness. Each Symbol has its own specific energetic Aura. As you are guided to bring your consciousness further into the Aura, you will be initiated into a deeper place within the symbol, within your self, receiving your awakening. Each Symbol is accompanied by its own Sacred Sound. As you work with these Sacred Sounds, you create a frequency that is uniquely yours, and which is recognized and received by the Symbol, and acknowledged by the entire Universe. Your unique frequency of sound acts like a key to a door within the Symbol, giving you access into energetic chambers that hold sacred aspects for you to recollect. You move into the chamber to access the "light Initiations" that are uniquely yours to receive now for your next step. It is important to note that each individual has their own unique experience, and hence each class is designed especially for you. Your Sacred Sound creates a resonance within your cells, which facilitates a rejuvenation and healing of your physical body. Your cells have been waiting for this cellular awakening process. The more you work with your Sacred Sound, the more you will merge with the natural light that the sound embodies. As you begin to master working with the Symbols and Sacred Sounds, there is a specific Hand Mudra. This Hand Mudra is designed to open up another dimensional birthing element to deepen your journey. Each Hand Mudra is an avenue to create a powerful alignment to different dimensions of light. As you become one with each aspect of the Mudra you will actually begin to move into a deeper connection and understanding of your self. This process subtly anchors you into a higher realm setting where you can stabilize in your life. There are many different aspects and energies to be experienced through the phases of the hand movements within each Hand Mudra. The sacred synergy of the Sounds, Symbols and Hand Mudra’s bring you into a natural expansion of fluidity that enables you to navigate back into your multi-dimensional self and to receive higher levels of your own light. Since each one of us is naturally a part of this unity of light, the initiations make it possible for us to return back home. beyond a limited reality of Your Life? 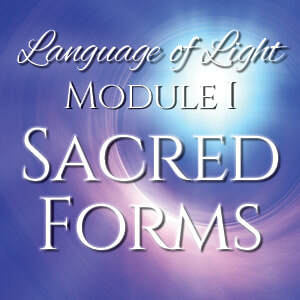 as you anchor new aspects of light within your cells? Are you ready to be empowered to take the next steps in Your Life? We as a human race are ready for this amazing life changing opportunity. that will open your vision, moving you beyond the limited reality of life. that has previously been untapped within you. ​moving you into the full realization of your natural birthright of abundance. Work with Christine on a journey into your body for “self healing” of your physical ailments. 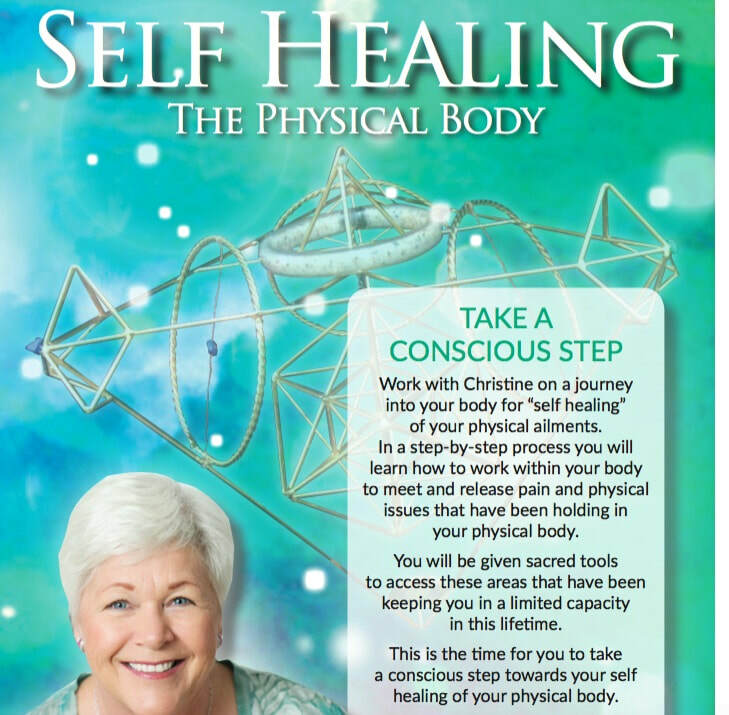 Work with Christine on a journey into your body for “self healing” of your physical ailments. In a step-by-step process you will learn how to work within your body to meet and release pain and physical issues that have been holding in your physical body. You will be given sacred tools to access these areas that have been keeping you in a limited capacity in this lifetime. ​This is the time for you to take a conscious step towards your self healing of your physical body and to allow the full life force energy to flow free. The tools you will learn enable you to continue working on your physical body for your ongoing self healing. This series is focused on clearing old belief systems that keep you weighed down, limiting your ability to move forward in your life, keeping you in cycles of struggle, fear or guilt. There are blocks within you that are in your way of you taking your next steps forward. These issues are simply lifted during the class, it’s as though a weight is gone without you even necessarily understanding what was there. 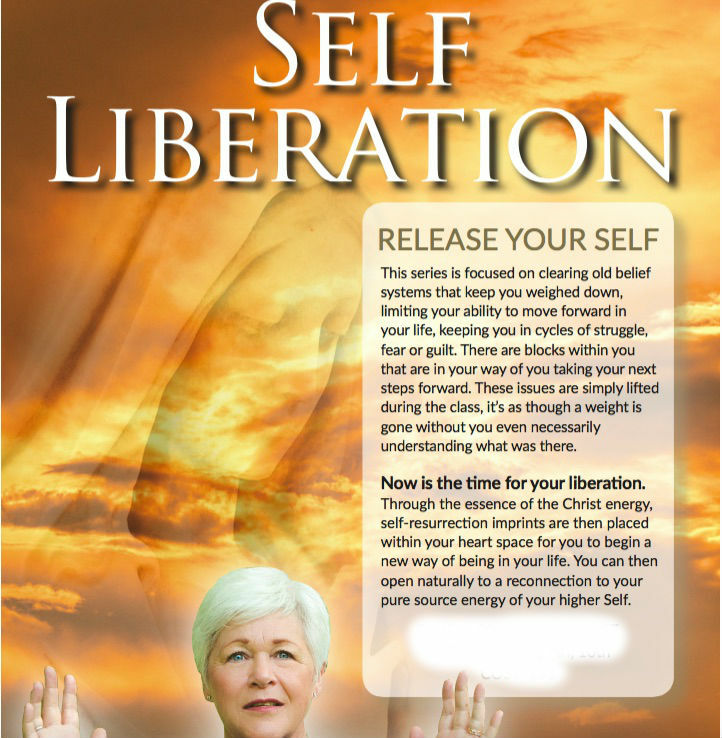 Now is the time for your liberation. Through the essence of the Christ energy, self-resurrection imprints are then placed within your heart space for you to begin a new way of being in your life. You can then open naturally to a reconnection to your pure source energy of your higher Self. "Everything that happened in class was for me, complete balance and appropriateness. Christine Day’s expertise in these energies allowed me to grow and expand. Her love and integrity was pristine. Thank you!" "One of the most amazing experiences of my life. Thank you." "I have no words to describe how BLESS I AM to have attended 3 Day Pleiadian Seminar with Christine Day! I know deep inside of me, how transformative this has been and will continue to be. It is truly a blessing without comprehension. We human beings, Mother Earth, all Kingdoms are so blessed to have here now, the pure Ambassador of Pleiadian Light! Forever grateful to you, Christine and the Pleiadian sisters. Thank you. Love you." "The energy felt of a high vibration and truth being spoken. Christine Day is a Master/Teacher. Some great learning imported and high energy transmitted. I feel new." "It is hard for me to find words to explain my experience. It was very transformational. I have felt very strongly that I am here to ‘change the world’ but I have struggled with the ‘how’. I know now that starting with a change of myself will bring me where I need to be." "This was the missing piece to my spiritual journey. I have found a new enlivened path but at the same time feel like I am rejoined in my spiritual home. Truly a life-changing event. Christine is a beautiful, talented woman who has pushed us thru the initiations and made my understanding of the Pleiadians very real. I became aware of my sacred heart. Thank you." "This has been one of the most amazing experiences in all my life. I have been transformed and will never be the same. Thank you Christine, the Pleaidians and the Creator!" "This work is by far the ‘purest’ I’ve encountered. It is healing and transforming and clearly anchored and integrated – not just another ‘high.’ Christine is brilliant, warm and totally ‘present’ with an open heart. I highly recommend this for anyone who is ‘serious’ about their role during these transformative times." "The most moving and powerful spiritual experience I personally have ever experienced. Well thought out, planned and executed for sure. Yet the unquestionable and sincerely genuine-ness of Christine Day is the powerful force that allowed me to relax and start what I feel is truly me. Meeting me with love and assistance for the first time in this lifetime. I am humbly grateful." "This was a very heart opening experience for me. I feel I moved through a lot of blockages and trekked through my emotional ‘baggage’. A lot of insight was gained and I appreciate the help I received from the Pleiadians to do so." "I could really feel the energy around me, in me and through me. I especially enjoyed and appreciated all the time given to integrate the energy. Thank you for assisting me in opening and meeting my sacred heart." "Thank you so much for your work and the transmissions. You have supported me in in-numerous ways. I do not have enough words. Your transmissions especially the light language hits real deep into my system. You have taken and opened me into new dimensions which I did not know exist. Thanks for your continued support, I hope to be as courageous as you are, I hope to hear the voice so clearly that the word courage is not needed. It would be a simple yes, a simple step forward. Lots of Love Many Regards"
"I have no words to explain every experience that I had going through the Master Class III My Soul is elated and so incredibly blessed. I am expanding so fast and so beautifully just like a metamorphosis has happened to my being. Bless you. I will continue to integrate all of the energy that has been reopened to allow the flow of the divine within me! My intuitive abilities are also expanding to embrace all that I am. Love and Light!" CHRISTINE DAY’s powerful and heartbreaking personal story has inspired audiences throughout the world. Born and raised in Australia, Christine experienced a traumatic childhood involving cult ritual abuse. In 1986, following a diagnosis of advanced systemic lupus, and having been told she had just two months to live, Christine experienced a profound spiritual awakening with the Pleiadians, which enabled her to move into a place of self healing. She has now been symptom free for the last twenty-six years. Over the past two and a half decades, Christine has become internationally renowned as the Pleiadian Ambassador, as a gifted spiritual teacher, healer and channel. Christine’s three books “Pleiadian Initiations of Light” “Pleiadian Principles for Living” and “The Pleiadian Promise” brings this work to a worldwide audience. Christine and the Pleiadians regularly present 3-Day Pleiadian Seminars in different areas of the world. She has a twice-monthly Internet Radio Show on www.blogtalkradio.com/christinedayonline and her popular Pleiadian Broadcasts are aired at regular intervals and available free on her website. She writes a monthly column for EdgeMagazine.net.